Lock in a great price for Petit Palace Suites – rated 9.3 by recent guests! You come to this hotel for the magnificent view of La Caldera (that's how the locals refer to this body of water). The suites are spacious and very clean. The staff is extremely friendly, helpful and accommodating. Weather delayed our trip by 3 days on a non refundable reservation and they modified our dates without assessing any penalties. Staff helps out with luggage, so you don't need to worry about climbing those stairs with your bags. Breakfast is great and customized to your taste. Limited parking available on site if you rent a car. Free shuttle to Fira. Was amazing our stay in the hotel. All the guys that work there very kind and helpfull. The hotel was amazing in every aspect, the rooms, the food, the amenities. I personally recommend the private dinner experience, it is wonderful. Kristina was really helpful at the reception ... really enjoyed the overall experience . The staff was lovely, for us the beautiful view and the people of the hotel were what made our stay special! The staff was amazing and so happy to help you with anything you need. The hotel is on the cliff so it has a very nice view of Aegean sea and the Nea Kameni (the volcano). The room is very lovely and clean. The breakfast is perfect. Outstanding view. Sunset is the best. I recommend it. Rent a bike or ATV for transportation. Petit Palace sits on the edge of the caldera, at Agia Irini area. The luxurious complex has suites with private pools and stunning volcano views, 500 feet above the sea. The spacious, designer furnished Petit Palace suites are carved into the rock and decorated in the typical Cycladic style. They are luxuriously furnished with hydro-massage bathtubs and include free Wi-Fi, satellite flat-screen TV and DVD player. Elia Restaurant serves fine Mediterranean cuisine in a romantic poolside setting. Petit Palace also has an elegant pool bar, where guests can have an evening cocktail and enjoying breathtaking caldera views. Certified Greek breakfast is served in the morning. Petit Palace is conveniently located just over 1 miles from Fira, where guests can find many restaurants, bars and shops. Santorini Airport is 5.5 miles from the property. Free on-site parking and free 2-way transportation to Fira is provided. When would you like to stay at Petit Palace Suites? Spacious and elegant suite with a separate living room and a jacuzzi bathtub. Tastefully decorated suite with a sitting area, a fridge and an LCD satellite TV with DVD player. Free Wi-Fi is available. Romantically decorated suite with private pool or private plunge pool. 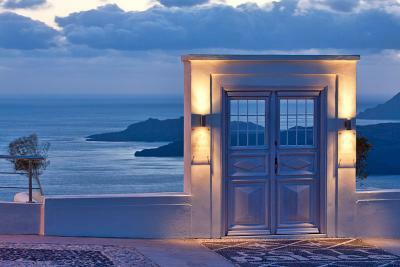 The spacious terrace overlooks the Aegean Sea and the caldera. 2-story villa with its own swimming pool and a spacious terrace with lounge chairs. Please note that only this room type can accommodate an extra bed. Overlooking the caldera from their private terrace or balcony, these elegantly designed suites are carved into the rock. The capacious bedroom is fitted with sleek designer furniture and warm welcoming color schemes. A bathtub is featured in the large bathroom. -10% discount on the Food & Beverage Department. House Rules Petit Palace Suites takes special requests – add in the next step! One adult is charged EUR 120 per person per night in an extra bed. Petit Palace Suites accepts these cards and reserves the right to temporarily hold an amount prior to arrival. Petit Palace Suites by Caldera Collection serves a Greek Breakfast certified by the Hellenic Chamber of Hotels. Location of the hotel is surreal and beautiful. Staff is very welcoming and excellent service. Must stay place. As outstanding as Petit Palace is, there's always room for improvement. The only real disappointment of my entire stay was the restaurant – specifically the dinner experience. The menu offerings were diverse and interesting but not well prepared. I ate in the restaurant twice, ordering different items each time and both were "meh" at best. It was a let down given the overall experience of the resort. Also, as an American – and not that this is a complaint really, more just a fact – the water temperature of the pool was pretty "brisk." To be clear, this is not unique to Petit Palace. All the pools and even the hot tubs in all the resorts I stayed in ranged between freezing and barely warm! This place was outstanding! My entire stay was quite simply, picture-perfect. I stayed here as part of a 15 day trip to Greece. I stayed in about a half-dozen hotels in Athens, Mykonos, and Santorini. Petit Palace was, by far, the best of the set overall. The suite was large and luxurious – an INCREDIBLE value for the price. The (free) breakfast was outstanding. (You could have it delivered to your room or enjoy it in the restaurant.) The view...stunning, breathtaking...any word that's synonymous with these words can fit here too. The staff were friendly and extremely helpful. I was always greeted with a smile and every interaction ended with the question, "is there anything more I can do?" From lugging my luggage up and down the stairs to booking a sail to telling me about some special, local events and places I might be interested in – they made sure I got the most out of my time on the island. Their spa services were top-notch. The shuttle they run into town was clearly the best way to get to and from as the parking...along with the driving...was all a bit too crazy for me. If I had to pick one place to stay in all of Greece, Petit Palace would be that place. Didn't see any way for handicapped guests to enjoy this property. Many stairs without dedicated handicapped access for wheelchairs, as far as I know. No small wash towels provided. They should be added to the towels set. No complimentary water bottles provided even though island water is not fit to drink. The view is incredible. The staff is very professional and friendly. The restaurant was extremely good and was not over priced and had big portions. Was the best hotel I’ve stayed in. Rooms are tired, need updating, not 5 star. The most annoying things are having to book breakfast the night before. I don't want to think about that the night before, I might have changed my mind by morning. We also encountered slow, rude restaurant service and at one evening, we didn’t see a member of staff in the service area for 15 minutes. Additionally, the 'penny pinching' is abysmal. Get 2 Nespresso capsules for whole week, then have to pay €1.50 per capsule!! No free bottled water for the room - €1.50 for a small bottle!! . One guest asked for a cup of tea for the room and was quoted €1.50 for the water for the kettle & €3 for a tea bag!!!! Travelled all over the world and never had 'rules' like this, . In comparison to the other Santorini hotel, we stayed at, it didn't have the view, but the welcome and service was overwhelming, with all expected services included. This hotel seems rather impressed and pompous with itself due to the view, but it takes more than a view to make a 5-star hotel. Bathroom was poor, shower had no screen and the entire bathroom was covered in water. Robes had holes in them also. Breakfast was extremely poor, every morning food was cold. Other guests also agreed they had the same experience unfortunately. When we notified staff it was merely heated up with no apologies offered. Room service was not flexible at all. We addressed these issues at the end of our stay with staff and no apologies were offered, they simply said ‘thanks for your feedback’. Loved the location and the pool, the courtesy bus was a bonus however could have been more frequent or add a later last bus as taxis were extremely hard to get from Fira back to the resort. There was only a two and a half hour period between last shuttle down to the town and back at 9.45pm. It doesn’t leave a lot of time for dinner and some shopping/drinks after. Absolutely everything. Fabulous hotel. Incredible view from the room,the restaurant and the pool. The staff all so friendly and helpful.I couldn't fault anything. The room wasn't cleaned properly before we checked in, more improvement is needed in that area. One tiny tiny point - the pool is a little chilly but I’d imagine in the height of summer it warms up with the sun! The bed was very comfy! Greg, the manager and his team were first rate. The hotel and its staff are lovely and very attentive. The breakfasts were superb with a lot of choice - some thing for everyone. The views offered by the hotel were breathtaking and the sunset views over the caldera are stunning! The lounge / bar deck area is a prime spot to watch the sunset with blankets on offer for when the sun goes down and it drops a little cooler. The hotel offers a free shuttle bus to Fira which we used a few times and found it very handy! As the hotel is five minutes out of Fira, it is not overlooked at all and feels private when spending the day by the pool. I’d highly recommend this hotel.